UPDATED: Wed., Dec. 20, 2017, 8:28 a.m.
WARSAW, Poland – The European Union’s executive arm triggered proceedings against Poland on Wednesday over Warsaw’s contentious overhaul of the justice system, a move that could lead to unprecedented sanctions as Brussels struggles to keep the recalcitrant member state on a democratic path. The decision to trigger what is known as Article 7 comes in reaction to several laws that the right-wing Law and Justice party has enacted during its two years in power that give it greater control over the justice system. Though the step was historic – no EU state has ever been censured in this way – for now it is largely symbolic as it involves a warning and mostly reflects the escalating tensions between Poland’s populist government and its EU partners. The final step in the process would involve sanctions, including the loss by Poland of its voting rights in the Council. This step, however, is considered unlikely to happen because it requires unanimity of EU countries, and Hungary’s government has vowed to block any such move. Either way, the developments reflect a dramatic historical reversal for Poland, birthplace of an anti-communist movement in the 1980s that inspired people across Eastern Europe and a country long praised as a model of democratic transition. “We are doing this for Poland, for Polish citizens,” so they can rely on a fully independent judiciary in their nation, EU Commissioner Frans Timmermans said in announcing the decision. 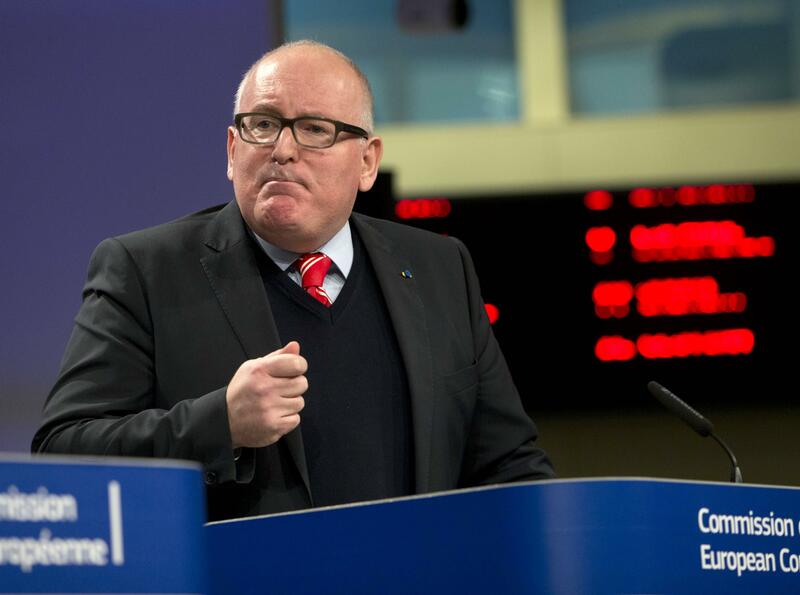 Timmermans said the decision was taken with a “heavy heart” but had become unavoidable because Poland’s authorities could not be persuaded to abandon laws that have been condemned not only by the EU but also by the United Nations, the Organization for Security and Cooperation in Europe and the Council of Europe, the continent’s top human rights body. Two of the laws – one on the Constitutional Tribunal and another one giving the justice minister power to name the presidents of all ordinary courts – have already taken effect. Two others regulating the Supreme Court and a body that appoints judges, the National Council of the Judiciary, were recently passed by parliament and still await the signature of the president. Poland’s government, which has defiantly gone forward with an overhaul of its court system despite two years of warnings from the EU, took the decision in its stride. He insisted the provisions were drawn from the justice systems of Western EU members. The ruling party, led by Jaroslaw Kaczynski, has long said its changes were needed to reform a corrupt and inefficient judicial system led by a “caste of judges” who it says are not accountable to anyone. The Commission must now submit a request to the EU member states to declare “a clear risk of serious breach of the rule of law” in Poland. That is essentially a warning, or in EU lingo, a “preventative” measure, that will require that acceptance of 22 EU countries. The procedure carries a number of risks. While it is unlikely to prevent the judicial overhaul, the escalating tensions threaten to increase anti-EU feeling in one of the EU member states with the highest support for the bloc, at more than 80 percent in most polls. Even some of the government’s staunchest critics have opposed the step, fearing it will create a sense among some Poles – particularly those who do not understand the complexities of the judicial laws – that they are being targeted unfairly by the EU. Ryszard Czarnecki, a member of Law and Justice and the vice-president of the European Parliament, called the step an “anti-Polish” move that is really meant to punish Poland for not taking migrants in a mandatory EU resettlement plan. As expected, Hungary came to Poland’s defense. Zsolt Semjen, the deputy prime minister, described the EU decision as “unprecedented and astounding” and reiterated the intention of Hungarian Prime Minister Viktor Orban to block any sanctions. Raf Casert in Brussels and Pablo Gorondi in Budapest contributed. Adds context, bylines. With AP Photos. Published: Dec. 20, 2017, 8:28 a.m. Updated: Dec. 20, 2017, 8:28 a.m. Tags: EU, Poland, sanctions, U.N.